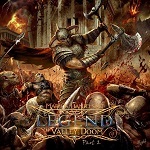 "Legend of Valley Doom Part 1" (2015) was highly praised by the power metal fans around the globe. If you enjoyed Part 1, you’re definitely in for a positive surprise. Where Part 1 took 10 years in the making and consists of a variety of free-standing masterpieces, Part 2 took Marius only 3 years and will take you to the next level of this epic metal opera trilogy. Breathtaking songwriting performed by some of the best metal musicians of our time and guided by a fantastic storyline. It doesn’t get much better than this.